Son Power is all about the ways God is moving in our lives. He is constantly generating the power for our impact on eternity. 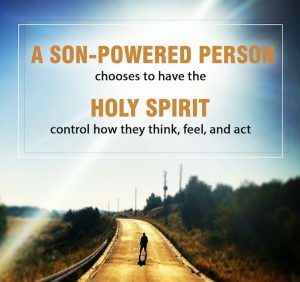 All believers have Son Power available to them. This power is found in the work of the Holy Spirit because of Jesus’ incredible sacrifice. As Jesus takes up residence in our life, he becomes a conduit for the empowering of the Holy Spirit. This power flows freely when we live a life that is in harmony with his revealed will. The Son’s power is eternal and it is this power that we vitally need to accomplish all that God has for us. When we allow Son Power to work in and through us, our lives, desires, and accomplishments will be transformed. As we experience Son Power, we go beyond a head knowledge of God and actually experience his Word personally operating in our lives. Experiencing God’s power puts us on the pathway to achieving a life that is hidden in Christ, a life that leads to not only a full and abundant life now, but also accomplishes an echo into eternity. The Son-powered life enables us to not only experience the very nature of God now, accomplishing all that he desires for us here on earth, but also empowers us to look forward confidently to the rewards that we will experience in heaven.